Once again, I ran across a great magazine while waiting in the doctor's office. 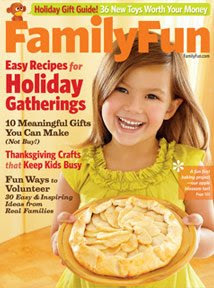 It's called Family Fun magazine, from the Disney Family. While Wondertime (also from Disney) is already on my list of favs, this is sure to top it. It is full of fun ideas and creative crafty projects. Now that my lil' man is in his toddler years, it will be fun to start doing crafts for him and with him. I can't wait for pumpkins this year!! I'm sure once we dive into the slime of a pumpkin, he will be less then impressed with the 'mess' but I'm still anxious to start such traditions.